Although Rhodes is a relatively small island (the fourth in Greece ), its location between East and West, close to Asia Minor, made Rhodes a crossroads of cultures and continents, and of course, through the centuries became an island rich in history. Bellow are some famous books about Rhodes, which can help the reader to get a clean and thorough overview of the historical and political situations in Rhodes through the centuries. Cecil Torr's book on Rhodes: "Rhodes in Modern Times" was first published in 1887. In the book Torr provides an account of the story of Byzantine Rhodes and the times of the Knights of St John, including the extraordinary events of the Great Siege which culminated in the Knights' expulsion from the island in 1522. 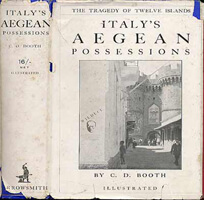 The writers describe the historical and political situation on Rhodes Island (and the Dodecanese group) in 1920's. The description is from fairness and a neutral point of view. Reflections on a Marine Venus is Lawrence Durrell's second travel book. Like the earlier work, it is devoted to a Greek island, in this case Rhodes , and memorializes a key period in its author's life. Having spent World War II in uncongenial Egypt , Durrell arrived on Rhodes in 1945 as Public Information Officer. A memoir (in 1960's) dealing with the 35 years he and his wife Mavis have spent in Lindos village. Written in a warm, exuberant style, the book paints a vivid picture of life in the village: learning the language, and raising and educating two children. Its pages are packed with portraits of the people they met in Lindos, Greeks and foreigners. Among the personages are the Pink Floyd band, S.J. Perelman, Germaine Greer, Martha Gellhorn, Nicol Williamson and R.D. Laing. Elias Kollias: The Knights of Rhodes. The Palace and the City. After a historical introduction to the Knights themselves, the bulk of the book provides an illustrated guide to sites associated with them on Rhodes . Color illustrations / photographs of Rhodes today, architecture, art, castle, palace, fortifications, illuminated manuscripts and other works. Plans and maps of the city. This is a true story about knights, Greeks, Turks, pirates, dragons and other strange and dangerous creatures. written and illustrated in a sort of comic book form It is an illustrated narrative of the brave deeds and remarkable feats as well as several wretched acts performed by the cross-bearing and sword-wielding monks of the order of St. John of Jerusalem. Told and illustrated by Vangelis Pavlidis, a native of Rhodes. In 1522, after a bloody Turkish siege led by Suleiman I, the knights were forced to evacuate the island of Rhodes... In this, the second instalment in The East Mediterranean Trilogy, Nanami Shiono weaves another rich and fascinating narrative around a key battle between Islam and Christendom. It also offers a rare glimpse into the history of one of the most important knightly orders, one that helped establish the tradition of medical care in the West as we know it today.